The founder of Marimekko, the legendary Armi Ratia, started Marimekko in the 1950s, developed it and took it through troubled times to achieve incredible success and renown. In the 1950s, Finland, like the rest of Europe, looked desolate. In the wake of the war, people had a bottomless yearning for beauty and a better life. While Finland groped in a grey workaday world at the start of the fifties, there stirred in the minds of several young designers the desire to create something unprecedented. Armi Ratia assembled a team of bold, fearless young designers, the best in their field, and began to create a new vision of peoples everyday lives. Marimekko was boldness, unconstrained young energy, creativity with no regard for rules and without borderlines. This essential heritage has continued to this day. Marimekko began to fill a grey visual vacuum with colours and to fulfil peoples dreams and wishes. There was no knowing if this would fall on fertile ground. Marimekko design, its fabrics and garments, began to strike a chord among circles sharing the same ideals. Marimekko also reflected subcultures that had started in the wider world, like the hippy movement and pop art. Avant-garde thought supported everything that Marimekko was. Everyday life became beautiful and Marimekko became a way of life. Marimekko became the baby-boom generations protest against their parents lifestyle and it provided an alternative to a grey and conventional world. 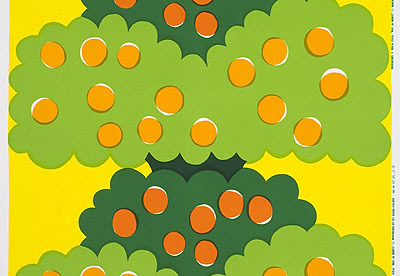 Marimekko was joy and the flavour of life. Genuine, creative talent endures, and oftentimes the passage of time only enhances the glory of talent. One of Marimekkos most individualist talented young designers was Maija Isola, who took part from the companys start-up onwards and worked for Marimekko for 38 years. The interior fabrics she designed brought about a revolution in Finnish homes in the fifties and sixties, and today they are more famous than ever. Maija Isola designed more than 500 patterns for Marimekko, of which the Unikko fabric has enjoyed a popularity that is totally unmatched. For my part, I would like to recount a small episode that took place 14 years ago, when I had just come to Marimekko and the fate of the entire company was still in the balance. 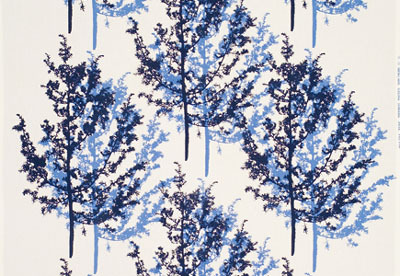 We picked a Maija Isola design, Fandango, for the Christmas range of fabrics. It was printed in gold on a red black and white base. Fandango became a big hit that Christmas. I felt a great sense of gratitude to Maija Isola. I sent her a cheque in thanks. Maija returned the cheque with a letter saying I needed the money more than she. This well describes Maija Isolas greatness and loyalty. It was Armi Ratias great dream to arrange a broad-based exhibition in honour of Maija Isolas lifes work. Now this dream has come true, for which warm thanks are due to the superb director of Design Museum, Marianne Aav, and her team. I would also like to thank Kristina Isola, the Marimekko committee, and our partners OKOBANK Group and Varma Mutual Pension Insurance Company for their help in making the exhibition a reality. Maija Isola joined Marimekko as a designer at the age of 22, immediately upon graduating. She was the first artist and designer on a regular salary at Printex/Marimekko, and the companys role in renewing printed fabrics was largely based on her work as a designer, producing over 500 printed patterns. From the outset, Isola sought a new image for printed fabrics. Her works are known for their large, bold designs and rich colours. 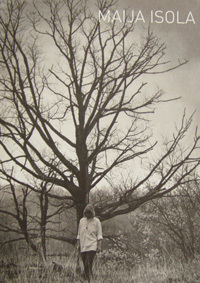 Isola found inspiration in nature, folk art and modern visual art alike. Her first complete series of printed fabrics was the Luonto (Nature) collection from 1957 for which she created the patterns by projecting photographs of plants directly onto the canvas. This was followed by the romantic Ornamentti (Ornament) collection based on East European folk art. The Joonas collection from 1961-1962 was in turn based on large designs created with free brushstrokes. Isola became particularly popular among architects with her Arkkitehti (Architect) collection employing large planes of colour. Design Museums exhibition MAIJA ISOLA  LIFE, ART, MARIMEKKO presents Maija Isolas beloved works and delves into the fascinating world of her art. Published in connection with the exhibition will be an extensive and richly illustrated catalogue on Maija Isolas life and works. Her lifes work is analysed from various perspectives. Her friends and colleagues present recollections of her, and Isolas output of 500 printed fabrics is presented with colour photographs. The contributors include Maija Isolas daughter the artist Kristina Isola, Dr. Mika Pantzar, a consumption researcher, the artist Kimmo Sarje, PhD., and Marianne Aav, Director of Design Museum. Photos: Max ja Moritz 1968, Kataja 1962. The other exhibition at Design Museum in summer 2005 focuses on three women artists whose works deal subtly with concepts of time and space. Each of them has a strong background in crafts, but they have expanded their work into the realm of free art. The Finnish ceramist Kristina Riska is noted for her ceramic sculptures and towers, which in their fragility spark images of immateriality. The Australian jewellery artist Margaret West uses natural stone as her material. She will build an installation entitled Still Life (natura mortua) out of 1,249 stone flowers in Design Museum. The American ceramic artist Paula Winokurs white porcelain sculptures are a kind of landscape. They are given a dimension of time through references to marks left by culture or erosion. (Mon  Sun)11 a.m.  6 p.m.
Closed on Midsummer Eve, Friday June 24th. Free guided tours in Finnish at 5 p.m. on Tuesdays and on 4 p.m. on Saturdays. In Swedish on Tuesdays at 4 p.m. Entrance fees: adults € 7, students € 3, comprehensive school students and children free of charge. Requests for guided tours subject to fee, phone: 358 (09) 622 0540, from 8 am until 11am. on weekends (Sat-Sun) 58 €.